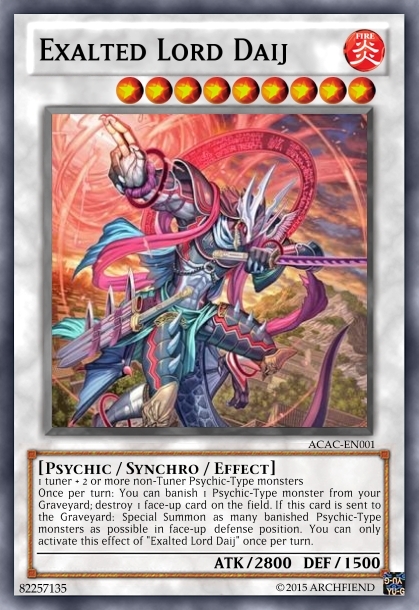 This (and only this) is the thread to post all of your own ideas for Yu-Gi-Oh cards, as well as posting feedback for other people's cards posted here! - Don't get impatient for people to look at your cards - it's understandable that you want people to acknowledge your work, but lashing out isn't the way to go! It also makes people less likely to want to look at your stuff at all. - Know the difference between constructive criticism and plain old dickery. This goes both ways! Don't assume people are mindlessly hating your input when they may simply be trying to tell you ways to make it better, and be careful to criticize properly and meaningfully when you're evaluating someone else's work. - This is less of an issue, but do try to make your cards clear: try sticking to psct or ocg numbering style (or a mixture of the two), and if you're worried an effect is unclear, add notes so that you can still get the desired intent across. Well, that's pretty much all I can think of at the moment. Have fun, you goofballs! Last edited by Deadborder; 15th September 2015 at 02:01 AM. To add to this, this is the only place where you're allowed to post CACs, this includes unofficial erratas. When a non-WATER monster(s) is summoned: Its controller chooses 1 of these effects. - The monster(s)' controller sends cards from the top of their Deck to the Graveyard equal to the Summoned monster(s)' Levels. - The monster(s)' controller takes 300 damage x the Summoned monster(s)' Levels. If you control a face-up WATER monster: Your opponent discards any number of cards in his or her hand, then, they take 500 damage for each card in their hand. Aaaaaand Subscribed. I'll have to dig up a bunch of what I made before. Now I just hope this doesn't end up getting deleted for someone starting a shitstorm over something stupid. From the Interstice: A New Beginning! A single thread, hm... Well, this'll get cluttered pretty fast. But whatever! I'll introduce you all to my philosophy in card design; I prefer to make cards that are universally useful and can be splashed into any deck, like Juragedo and Archfiend Eccentrick. If I do make an archetype, it better be damn special in its gimmicks. I'll get to an archetype or two later but, for now, let's start things off nice and simple! I had a character in mind for these cards. She's a hypothetical protagonist for another Yu-Gi-Oh! spin-off. Dunno what her name is but she's a Duel Tutor (basically a hired teacher for duelling). Most of her clients are parents who either want to help their kids learn how to duel or they're learning to duel themselves so they can play with their kids. Her left arm's actually a cybernetic limb with a built-in Duel Disk projector and deck holder. What you see now are her ace, her trump card, and her engine. Once per turn: You can banish 1 Psychic-Type monster from your Graveyard; destroy 1 face-up card on the field. If this card is sent to the Graveyard: Special Summon as many banished Psychic-Type monsters as possible in face-up defense position. You can only activate this effect of "Exalted Lord Daij" once per turn. Welp, I was honestly looking up for more liberties. I guess I'll eventually use this thread as a place to badvertise my stuff on Pojo. CaC's are too stigmatized for their own good. That first one is going to hurt like hell when you're facing Infernoids, Lightsworn, Shaddolls, or Burning Abyss. That second one... It has a unique risk-reward factor going on there. Happy for a section like this. I know this is generally something people aren't fond of, but at this point some of what Konami actually releases far exceed some of the fanmades. I have a couple of old ones to share. Declare 1 card name; if that card is in your opponent's hand, they shuffle all copies of it from their hand into their deck, otherwise your opponent selects 1 card from your hand (min. 1) to shuffle into your deck. Activate only when a Trap Card that targets 1 player is activated. Pay half your Life Points; The effect of that Trap Card is applied to the other player instead. Pay 1500 Life Points. Negate the activation and the effect of a Trap Card and destroy it. Then, if you have a Trap Card with that name in your Main Deck, you can set it. You can send this card and 1 other "Gusto" monster from your hand to the Graveyard to negate the activation of an effect targeting a "Gusto" monsters you control, and if you do, destroy it. When this card is Special Summoned from the Graveyard, draw 1 card, but you can not Special Summon any monsters for the rest of the turn, except for WIND monsters. 1 WIND Tuner + "Pilica, Descendant of Gusto"
When this card is Synchro Summoned, you can select 1 "Daigusto" card in either player's Graveyard and Special Summon it to your side of the field in face-up Defense Position. During the turn that you activate this effect, you can not declare any attacks, except with "Gusto" monsters. If this card you control is destroyed by your opponent (either by battle or card effect), you can Special Summon 1 "Gusto" Tuner monster from your Graveyard to your side of the field. You can only activate 1 effect of "Daigusto Pirikamenokos" per turn, and only once that turn. You can only control 1 face-up "Daigusto Pirikamenokos".